After upgrading your farm house from its original shabby state, you will have access to a kitchen. The kitchen includes all the utensils that you will need to cook up some tasty food, but you will need to obtain cooking recipes; the kitchen does not permit for culinary exploration by tossing random ingredients together. You can only cook a dish if you have its recipe in your cookbook. Recipes can be purchased from the town restaurants or from winning festivals. You won't discover recipes while fishing or mining. 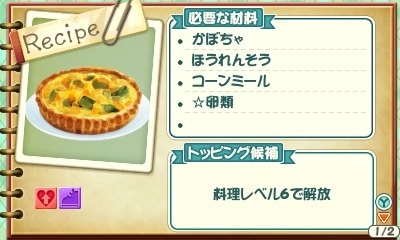 Each recipe will show an image of the finished dish, the ingredients you need, the possible toppings that can be added or the minimum cooking level required to add toppings, and its status effects if they have been discovered by you eating the dish; if you haven't eaten the cooked dish yet, the stamina effect icons will display as six [?] boxes. Press the Y Button to swap the recipe's profile to display its base .5 Star shipping profit, its theme category (Westown, Lulukoko, or Tsuyukusa), and its description. The ingredients you need to cook the dish will pull from your bag or your farm house storage. When you've selected your recipe, press the A Button to bring up the ingredient selection menu. Pick the ingredient you want to use in the recipe, then press the confirmation button to see the possible Star Rank of the completed dish. You can also select the number of cooked dishes if you've enough ingredients to make more than one. Press A one more time to create the cooked recipe. The resulting dish's Star Rank is the average of the Star Ranks of the ingredients you selected. If the recipe name is grayed out on your bottom touch screen, then you don't have the required ingredients to cook the recipe. Using giant crops as ingredients will result in receiving a bonus of five cooked dishes instead of one for each giant crop you use. Using golden crops will increase the Star Rank by +50 Star Points. These benefits stack if you happen to use a giant crop that is also golden. Using high-quality animal products (Great Eggs, Great Milk, etc.) will add +30 Star Points for each one used. You cannot go beyond 300 Star Points (5 Stars) unless you add a topping to the dish. Some recipes require specific ingredients and some simply require a general ingredient such as "milk," "vegetable," "fish," and so on. For these ingredients you can use anything from that category. For example, a recipe that requires "milk" will accept Milk, Jersey Milk, Buffalo Milk, and other milk as an ingredient. Increasing your cooking level is based on the number of dishes that you cook and not on the number of times you use the kitchen as in the last Story of Seasons game. Each level you gain will trigger a Star Rank multiplier, up to 1.5x when your cooking level is at the maximum level 10. You can see your cooking level by checking the Trophies section of your farm house bookshelf. As you increase your cooking level by cooking large quantities of dishes, you will unlock toppings that can be added during the ingredient selection. While you can cook recipes regardless of your cooking level, toppings can only be added to dishes once your cooking level reaches the required level for the recipe. Recipes can have up to three possible toppings such as additional crops, Salt, Mayonnaise, Soy Sauce, mushrooms, herbs, and other ingredients. The profile for each cooking recipe will tell you if the dish accepts toppings, what the minimum cooking level you need to be at to add toppings, or what toppings are allowed for that recipe. Adding toppings to a dish can unlock the cooked dish's Star Rank to go beyond 5 stars. Any dish with more than 300 Star Points will display its 5-star rank as red colored stars instead of the standard yellow colored stars. A dish with red stars will sell for more and can increase your chances of winning the seasonal Cooking Contest. Toppings will not add or remove status effects. Since the Star Rank of the cooked dish is an average of the combined Star Ranks of all ingredients, using a low Star Rank topping ingredient may possibly reduce the overal Star Rank of the resulting dish.